Today I'm testing out Robert Oster Lipstick Red, mostly because I'm obsessed with reds and greens right now. Lipstick Red is one of the newer inks from Robert Oster this year, I think he announced it on Instagram on June 26th, but I've just recently seen it show up at ink retailers in the US. I purchased my sample of ink from Vanness Pens. Lipstick Red is a dusky red, almost a dark pink. It's not super saturated, so I think it will show some decent shading. I love the shading that shows on the large swab. There is a big range of color between the lightest and the darkest. Let's take a look at how the ink performs on fountain pen friendly paper first: Rhodia, Tomoe River, and Leuchtturm. Bleeding: I'm going to say none, because it didn't bleed in writing, only in large swabs. On Sustainable Earth 20lb copy paper, there was some feathering, but when I tried it on Step Forward Paper 21lb copy paper, I didn't see any feathering, so how this ink behaves really depends on the paper you use. 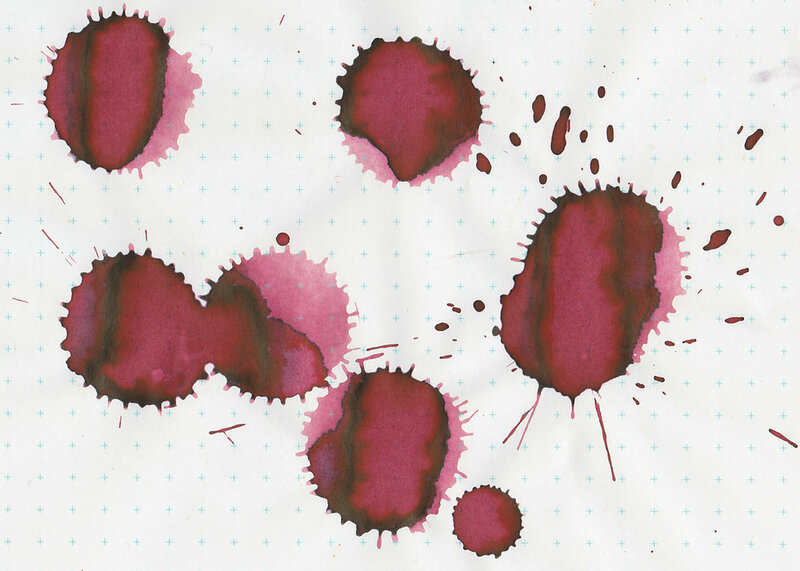 Ink swabs for comparison, left to right (top to bottom for mobile RSS): Robert Oster Maroon 1789, Robert Oster Lipstick Red, and Robert Oster Australian Shiraz. Click here to see the Robert Oster inks together. Sailor Jentle Oku-yama, Diamine Burgundy Royale, and Robert Oster Clay Red. Click here to see the red inks together. I think Burgundy Royale is the closest to Lipstick Red, because it has a similar tone, but it is a lot darker than Lipstick Red. I used a Visconti Hall of Music Burgundy Jazz with a fine steel nib, on Tomoe River paper. I didn't have any flow issues, the ink felt like it had an average flow. I ended up doing a small writing sample because I wrote the pen dry. Oops. Overall, there is some nice shading due to the semi-saturated color of the ink. It does remind me of a lipstick color, so I think the name is fitting. It's well behaved, so if you like the color, give it a shot.